Mr. John Ousley was the first White House gardener. He was hired for this position in 1825 by none other than President John Quincy Adams (JQA), our sixth President of the United States. He remained the White House Gardener until 1852. Currently, Mr. Ousley leads guests on his own Pickle Pea Walk, What a President Tells His Gardener, around the President’s Neighborhood outside the White House in Washington, DC. As the title suggests, you may be surprised by what JQA shared with his gardener. Side Bar // What do you think? Did JQA and John Ousley talk politics or gardening at their recent meeting? And the JQA of this meeting is currently performing at Arena Stage in Washington, DC in the world premier, power play JQA, written and directed by Aaron Posner. Left to Right: Phyllis Kay, Eric Hissom, Johnny Weissgerber (John Ousley), Jacqueline Correa and Joshua David Robinson. 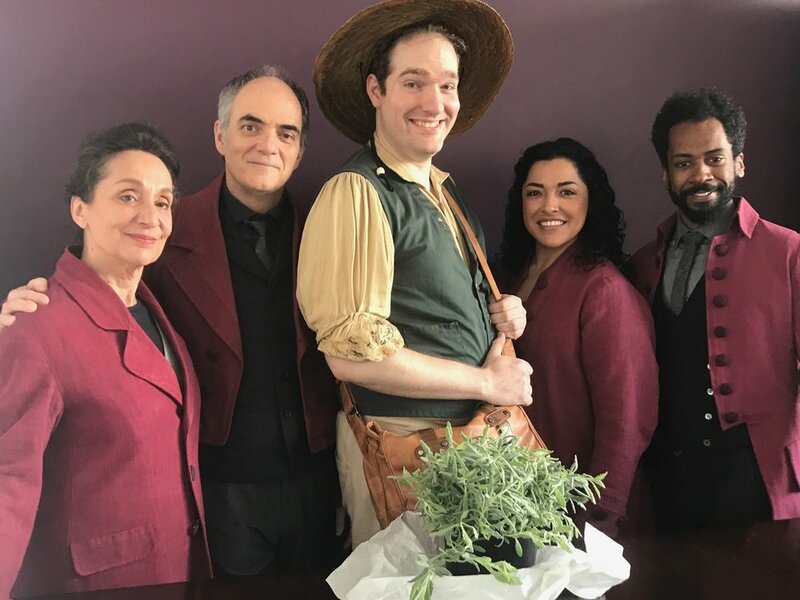 Here’s our Mr. Ousley with Arena Stage’s JQA, JQA, JQA and JQA. What!? “JQA” is a work of historical fiction composed of nine two-character scenes. Through those vignettes, Adams engages in conversations with myriad historical figures, including George Washington, Frederick Douglass, Abraham Lincoln and several members of his own family — all of whom are also played by the four principal actors. Both our What A President Tells His Gardener Walk and JQA do have a few things in common, just as the President and his gardener did. They both allow guests to take a look at the politics and players of a bygone era through the eyes of someone who was actually there. They both permit guests to simply observe. Then, free from needing to absorb facts and dates and who did what and when, guests are able to feel the emotion of it all and to be newly curious about how the tour/play relates to the present and to the future. Hope you have the opportunity to take-in both the play and the walk! JQA runs through April 14 at Arena Stage, 1101 Sixth St. SW. 202-488-3300. What A President Tells His Gardener is a Pickle Pea Walk with Mr. John Ousley. Tuesday evenings at 6:30pm and Saturday mornings at 10:00am from Saturday, April 13 – Saturday, August 31, 2019.